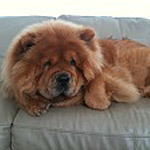 Hi can I please use this pic of Hugo bear as my avatar? Do you have a larger version of this photo? Avatar images need to be 150x150 pixels square and this image is 150x112. If you post a larger version I can crop and size it to the right size. Thanks. I had a friend over who is very computer savvy, so I can't do it but next time he visits, I'll try and remember to give it another try. I was able to resize the image to 150x150 while keeping it looking fairly good. 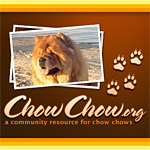 It has been added to the Members Chow Chows 04 (Large) avatar gallery for your selection. Enjoy!